From the gracious slopes throughout the sleigh-style head and foot boards, to the smooth, plush look of the three piece leather panels, our Marshfield Panel Bed has a classic warmth and elegant style that will make a huge statement as the star of your bedroom suite. Starting life as pieces of carefully selected North American hardwood, and crafted by the skilled hands of Amish artisans, this amazing bed offers an heirloom integrity that can be loved for a lifetime and still have enough backbone to serve generations to come. 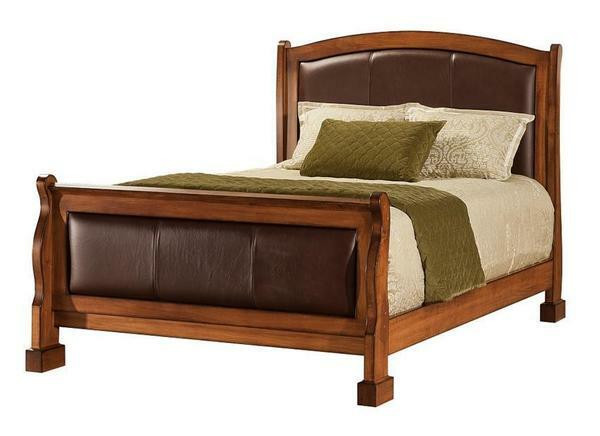 Modeled after a classic Louis Philippe style, this toned down sleigh bed offers curves in all the right places. From the smooth arch that runs the span of the headboard to complement the leather panels, to the bow and matching shape of the strong legs, the elegance of this bed will leave you feeling like royalty. Mixed in with this older, European Style, is the addition of solid hardwood side rails and a large, rectangular foot that provides a rustic, country charm - along with a firm foundation for the entire piece. Inside the side rails that connect the head and foot boards you'll find a solid wood slat support system that is dovetailed into cast aluminum brackets, along with support posts that line the center, ensuring your mattress in box spring are sag free for the life of the bed. Any bedroom, any style - our Marshfield Panel Bed is versatile enough to make a statement anywhere. Through the menu options above, you can choose your preferred size to fit the room you are revamping. From twin or full for a smaller room, to king or queen for the master, you'll have every size available for the perfect fit. From there, choose the preferred hardwood for your new bed. Shown in Brown Maple, this naturally contrasting dark and light colored wood is perfect to match with a variety of different looks and will take stain nicely. Opt for a Cherry for that rich grain and naturally darkening tones, or a rustic wood where knots and natural marks add a truly unique, warm look. Once you've narrowed down your preferred wood choice, a variety of different, vibrant stain finishes become available - allowing you to get the perfect combination to complement existing decor, or start fresh with your favorite. Choose to have this dry brushed or stained standard, along with a matte varnish or semi-gloss to finish the look. With the size, wood, and finish selected, move to the leather head and foot board panels and find the perfect color to go with your motif. There is no right or wrong choices here - so choosing your favorite or one that will complement the look you're going for will do just fine. Once you've narrowed down the exact look, your new bed will be handcrafted just for you. The special attention that goes into each piece ensures a new family heirloom that will look great for many decades to come.